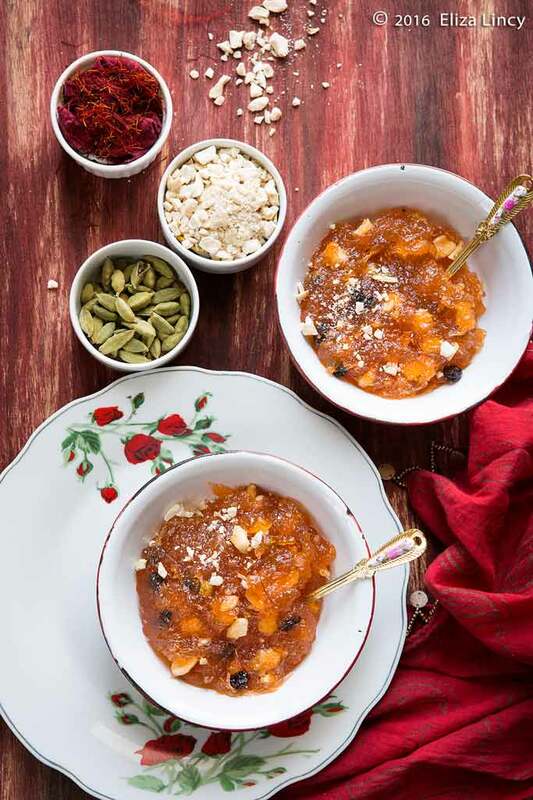 Kasi Halwa Recipe or Kashi Halwa or White Pumpkin Halwa is a sweet served generally at weddings or prepared at home during festivals. Its is a famous sweet of Karnataka. It is very popular sweet of Udupi Cuisine. I was planning to make this halwa and buy ash gourd and finally ended up making some curries to finish it off. Usually i make Poosanikai mor kuzhambu| moru curry with this ash gourd. 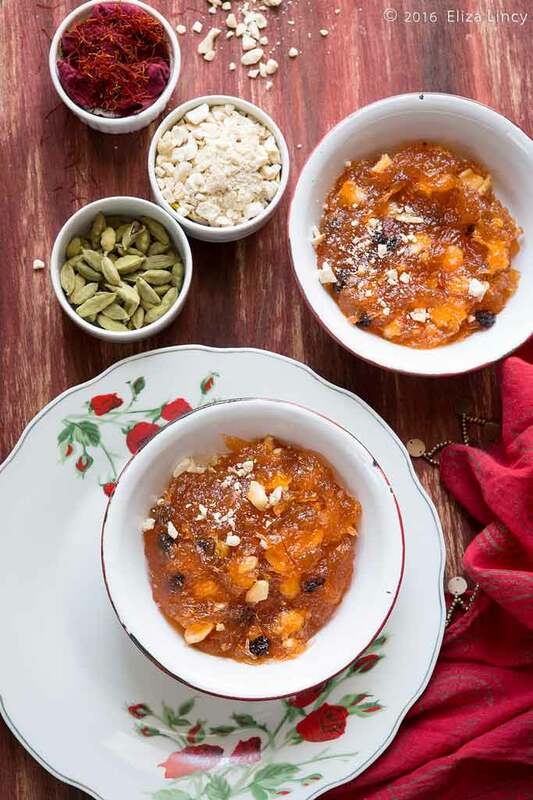 Talking about the taste of this halwa the taste of the halwa is very similar to other halwas. But the texture is slightly different. It has a slight crunchy texture from the ash gourd. That is very peculiar in this dish. I have seen Venkatesh Bhat's program in television and in that he was mentioning about the importance of the texture. Peel and remove the pith and seeds from ash gourd and cut into pieces. Grate the ash gourd pieces using carrot garter. Now take a clean cotton cloth or muslin cloth and strain the water from the ash gourd. You could use metal strainer too for this process but squeeze the water well from the gourd. 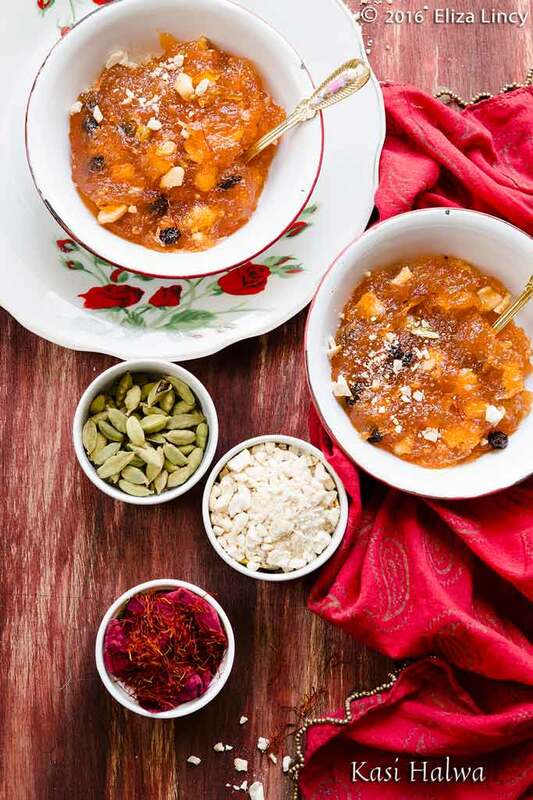 Measure the squeezed pumpkin and take equal quantity of sugar for the halwa. I got 1 and half cups of ash gourd after squeezing so i took 1 and half cups of sugar. 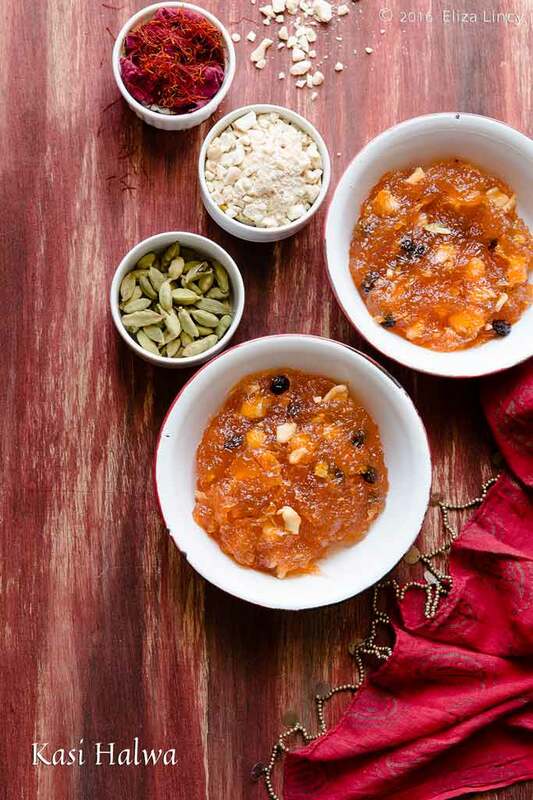 Keep a heavy bottom vessel or nonstick pan on top of stove and add the ash gourd water.These steps are essential for retaining the texture of the halwa. Bring it to boil. Once it is boiling add the squeezed ash gourd and mix well and close with a lid and allow to cook. Cook till almost the water evaporates and the ash gourd is half cooked and become translucent. Now open the lid and add the sugar and a pinch of salt; mix well and allow the sugar to melt. Add the lemon juice to prevent the sugar from crystallization. Add a pinch of saffron of red food colour and mix well. Once the sugar get absorbed by ash gourd, add 2-3 teaspoons of ghee. I used very less ghee as i have prepared halwa in a nonstick pan. Allow the halwa to cook inside the ghee for some time. Now the halwa starts to leave the pan and bubble at the edges. Keep the flame to low. Meanwhile heat a teaspoon of ghee on a pan and fry the cashews and raisins. Now sprinkle cardamom powder on top of halwa. Sprinkle a pinch grated nutmeg and cooking camphor if you wish. Finally add the ghee with fried cashews and raisins and mix well and switch off the gas.